Trevor Bauer was dominant at Double-A to start the season. He may have outdone himself in his Triple-A on Friday. MLB.com's No. 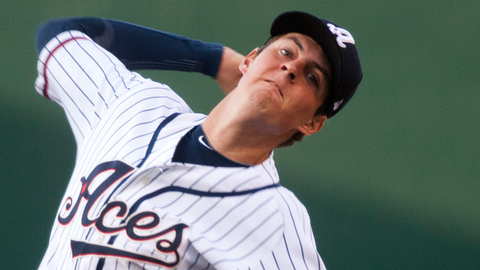 8 prospect tied a career high with 11 strikeouts and allowed one run on four hits over a career-best eight innings as the Reno Aces edged the Oklahoma City RedHawks, 2-1. Bauer (1-0) carried a shutout into the eighth before allowing a leadoff homer to Landon Powell. He set down the next three batters, striking out the final two match the personal best he established on April 20 for Mobile. "I'm happy the team got a win. It's always fun to win," Bauer said. "I always expect to win, I always hold myself to a high standard. I go out there and compete, no matter what level I'm at." Selected third overall by the Diamondbacks in last year's Draft, Bauer ran into early trouble. He allowed one-out singles in the second to Scott Moore and Brett Wallace but struck out Brad Snyder and watched as Moore was caught trying to steal home. In the third, Brian Bixler doubled and took third on a wild third strike to Jimmy Paredes, but Bauer stranded him there by fanning Fernando Martinez. The 21-year-old right-hander did not allow another hit until Powell's blast. He walked one, equaling a season low, and threw a career-high 113 pitches, 73 for strikes. Bauer had a feeling he'd pitch well in his first exposure to the Pacific Coast League, based on how he warmed up. "I had a terrible bullpen before the game. It would have worried me more if I had a good one," he said. "For whatever reason, I'm better off when I have a terrible bullpen [session]." Following his last start on May 19, Bauer spoke about how he was enjoying his time at Double-A Mobile. While he was happy to move up a level, he described the promotion as "a little bittersweet". "We were heading off to a Jackson for a big series and I was looking forward to it, but whenever you get moved up it's a good thing," Bauer said. "There's parts about leaving that I'll miss, but I'm excited to be here in Reno with all my new teammates." Despite the high pitch count, Bauer would have liked to get a chance to finish what he started. "I was hoping to," the UCLA product said. "I love throwing complete games, but I had 113 pitches at that point, so I don't expect them to send me out there this early in my career; it's the manager's decision. I just try to do the best I can while I'm out there." Reno held on for the win, thanks to center fielder Adam Eaton. The D-backs' No. 16 prospect threw Moore out at the plate with one out in the ninth, a play Bauer described as "huge." "It's funny. I was charting with [Zach] Kroenke yesterday and I was just talking about how [Eaton] lives for throwing guys out in the outfield," Bauer said. "As soon as I saw he had a play on it, I had a good feeling about it because he has a good arm." Strong debuts are nothing new for the California native. In his first pro outing for Class A Advanced Visalia last July 30, he tossed two scoreless innings. He followed that with five shutout frames on Aug. 14 in his Southern League debut. After Friday's gem for the Aces, Bauer was asked how many innings he might pitch in his big league debut. "Maybe 12," he said with a laugh. "I just try to focus on pitching and controlling what I can control. Hopefully, it goes as well when I get a callup to the Majors." Jonathan Albaladejo allowed one hit and recorded the final two outs for his seventh save. Mike Jacobs hit a solo homer and Josh Bell delivered a run-scoring double, giving him 30 RBIs in 24 games with the Aces.